Saturday morning, participated in the new TNF Trail Run. This is a series of monthly trail run to acquaint runners to trail running and will lead up to the North Face 100 Challenge. This inaugural run started off at the Bukit Timah Visitor Centre and subsequent runs will cover new trail routes like the Pulau Ubin trail, Lorong Halus Wetland and the mysterious Woodcutters' trails among others. Included as part of the series will be the 2 TNF 100 Challenge Progressive runs. Runners participating in this series of runs will gets product samples; discounts and some entitlements to the TNF 100 Challenge subject to some terms and conditions such as minimum attendances. Anyway back to the run. About 30+ runners turned up bright and early at the Bukit Timah Visitor Centre. 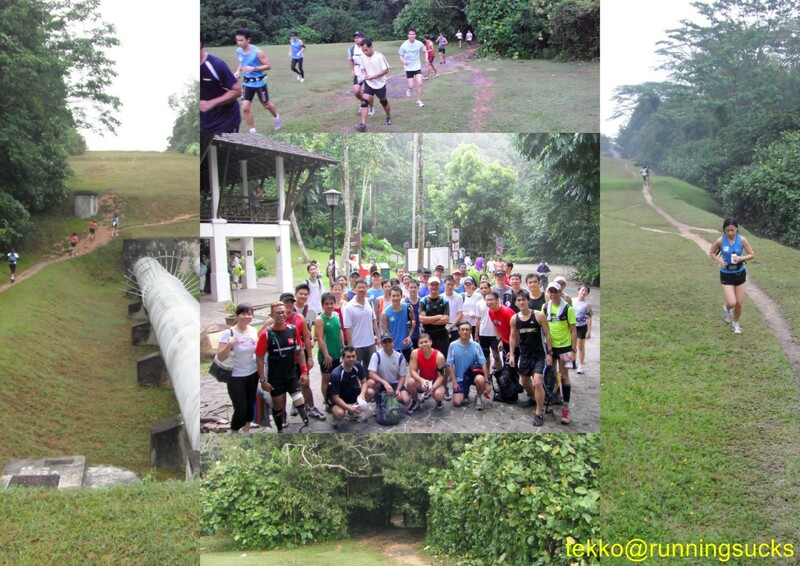 After registration and a short briefing, the group took off for a 12km run through the forest of Bukit Timah. The designated route was a combination of the past 2 years TNF Challenge route. However, the 12km came up short and turned out to be not more than 8 km. Somebody aka me underestimated the distance and sell the runners short. Sorry guys. Apart from that, there was a further little hiccup. There were a mix of experienced and newbie. The run leaders deployed were also new to this and along the way confusion arises over the route as well as trying to rein in the fast runners and getting the slower ones to catch up. Some runners also failed to bring their own water despite repeated reminders on the emails and briefing. But it was I think generally a good effort for a first run. And it can only get better with time.